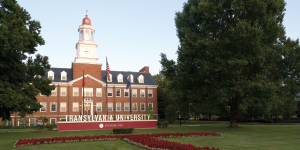 Founded in 1780, Transylvania University has one of the longest histories in American higher education. 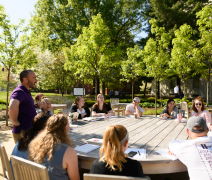 Today its students build lifelong relationships with professors and peers while engaging in a rigorous liberal arts education that prepares them for the 21st century. Transylvania’s premier strength is its faculty. Professors are personally involved in their students’ success and committed to challenging them in the classroom. Ninety-eight percent hold a PhD or the highest degree in their field. 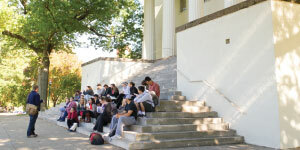 There are no teaching assistants, and first-year students interact immediately with full professors. Transylvania alumni are also actively involved with Transylvania students. During their first year on campus, students are paired with successful alumni in a variety of careers through the 100 Doors to Success mentoring program. These student-alumni connections help students navigate the path from college to career and build a network of support they can rely on even after they graduate. While the Transylvania campus is intimate and easy to navigate, it’s nestled in downtown Lexington, Kentucky, a thriving city of 300,000 people, including about 30,000 college students. Students can enjoy the best of both worlds: a friendly, tight-knit campus community amid a regional center for cultural activities, entertainment, sports, internships, and jobs. Transylvania encourages students to volunteer in the surrounding neighborhoods and pursue work experiences in the schools, businesses, law offices, accounting firms, medical centers, arts agencies, and government offices just a few blocks away. Easy transportation options include walking, biking, and the Lextran city bus. Of course, the Bluegrass region of Kentucky is known for its beauty—scenic horse farms, hiking and biking trails, and city parks are just minutes away. Transylvania students are also interested in the wider world, and the majority choose to study abroad for a term. Faculty-sponsored May term courses have included studying writing in Ireland, early art in China, economics in Costa Rica, and international business in Germany. Concerned about the cost of a college education? Want to be sure you’re making a good investment for your future? Transylvania’s Pioneer Pledge guarantees that first-year students will graduate in four years if they carry a full course load for eight consecutive terms and make steady academic progress. Academic advisors help students stay on schedule to fulfill all requirements for their chosen major(s). Many employers and graduate programs recognize the quality of Transylvania graduates and are eager to consider them for openings. Within six months of graduation, 57% of Transylvania graduates are employed and 38% are in graduate or professional school—a 95% success rate. Further, 100% of Transylvania students recommended for law school and more than 90% of students recommended for medical school are admitted. We understand that college costs can seem prohibitive. Transylvania’s tuition and fees fall below the national average for comparable private liberal arts colleges, and last year, 100% of Transylvania students received financial assistance. First-year students receive $27,139 on average in scholarships and grants.